The pokies industry is a complex one, with anti-pokies renegades fighting to protect the everyday man as giant casino moguls reap the financial benefits of the thriving gaming industry. But who are these kingpins who have made millions from the popularity of pokie machines? We take a look at some of the most influential casino tycoons, both in Australia and worldwide, and how they made their millions. James Packer, Australia’s biggest pokies mogul. 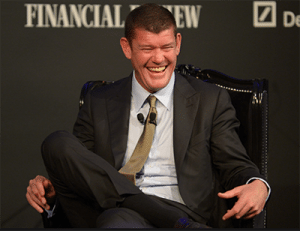 Despite recently relinquishing his majority share in the Crown Resorts group, there is no bigger name in the Australian casino industry than James Packer. Son of the late media mogul Kerri Packer, James Packer turned his focus away from the family’s traditional media businesses after the death of his father and devoted himself to establishing the worldwide gambling empire, Crown. The Crown name has since become one of the biggest names in the gambling industry, with world-class casinos in Melbourne and Perth, while Crown Sydney is underway and set to open in 2020. Packer also owns a stake in Melco Entertainment Group, which has high-end casinos in the Philippines and Las Vegas. Along with his casino ventures, Packer has had financial stakes in Network 10, SEEK, CarSales.com.au, Channel Nine, One.Tel, RatPac-Dune Entertainment and many others. In 2016, Forbes named him the sixth richest Australian, with a net worth estimated at US$3.50 billion. Given Packer’s prominence in the Australian media, his personal life is often publicised, especially due to his whirlwind engagement with pop diva Mariah Carey, which came to an end in late 2016. At the age of 83, Sheldon Adelson is Americas biggest casino mogul, and is widely considered the gambling industry’s most influential player. In 2016, Forbes reported Adelson’s net worth at a staggering US$32.2 billion, making Packer’s fortune look like chump-change in comparison. Adelson made his billions in multiple casino ventures, including as founder, CEO and chairman of the Las Vegas Sands corporation, which owns casino properties in the USA, Macau and Singapore, including Marina Bay Sands, The Venetian, Sands Macau and the Sands Expo & Convention Center. He is widely considered to be responsible for the concept of integrated resorts, which are casinos that incorporate other facilities like hotels, dining and entertainment – the most popular casino business model used by casino moguls today. 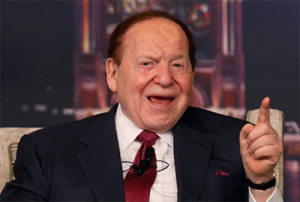 In addition to his casino endeavours, Adelson owns newspapers the Israel Hayom and the Las Vegas Review-Journal. He is a huge Trump supporter and was the largest financial donor in the 2016 US presidential elections. Adelson is strongly opposed to online gambling and has become an influential figure in the fight against online casinos in America. 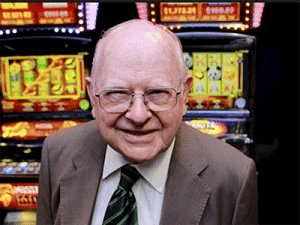 Although his wealth is hugely overshadowed by Packer and Adelson, with a net worth of a measly $760 million, 93-year-old Len Ainsworth is one of the most influential pokies moguls in Australia and is responsible for making the electronic pokier machine industry what it is today. With nothing more than a high school education behind him, Len founded the pokies manufacturing company, Aristocrat Technologies, in 1953, which remains the second biggest gaming machine company in the world today. He also funded Ainsworth Game Technology, which is another giant player in the electronic poker machine game. Len Ainsworth is well known around the world as having pioneered many of the major design and technical innovations of modern poker machines. He has received such honours as induction in the Australian Gaming Hall of Fame and the US Gaming Hall of Fame (which also includes Donald Trump) where he remains the only Aussie to ever make the cut. Despite technically being worth billions, Len has gifted a large stake of his shares in Aristocrat to his wife and seven children. He regularly makes it to the list of Australia’s richest people. You don’t earn the nickname “The King of Gambling” without making some dramatic changes to the industry along the way, which is exactly what Stanley Ho did. Although Ho is now retired from the casino industry, he is responsible for turning Macau into the world-class gambling hub that is today, retaining a monopoly on the Macau casino industry for over 40 years. 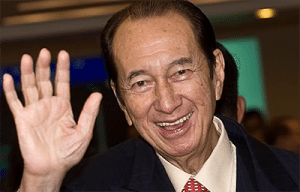 Along with his casino properties, Ho has investments in real estate, tourism, banking and shipping, and it’s estimated that a fourth of the Macau workforce is employed by one of his companies. Not only is Stanley Ho the richest person in Macau and one of the wealthiest people in all of Asia, he also has four wives and 17 children.